C2C by Batribike. 1 Dash, 1 Granite and two old men. 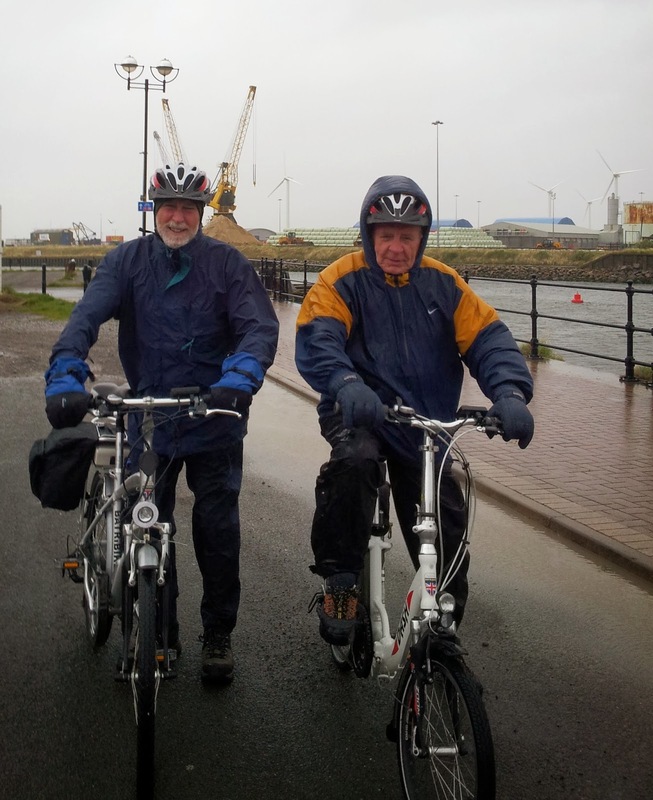 Recently one of our dealers, Jeff at Electric Dragon Cycles, completed the C2C cycle route. The route is coast to coast from the Lake District in the west to the east coast at Sunderland. He has written a lovely report which I felt sure everyone would love to read. Our magnificent support team of my wife Fiona and our son Keith drove us to the starting point after a pleasant nights stay B&B in Cockermouth. The intention had been to have had a nice meal out the night before but the whole of Cockermouth's restaurants were fully booked, so we had had fish and chips sitting outside on a bench. The arrival at Workington was epic. We did not bother with dipping our wheels in the Irish sea mainly from fear of being swept to our deaths, but anyway there seemed to be enough of it crashing over us in the gale force wind. Luckily any salt was washed off by the rain coming down, or more accurately horizontally in stair rods. Mounting our trusty steeds we set off at a cracking pace, unfortunately in the wrong direction. We blame the lack of signs which were very poor compared to the rest of the route! Luckily we were prepared and went to get our guide book and satnav out. Due to the wind, rain and failing eyesight, made worse by the inability to see through our glasses, we abandoned these and looked for someone to ask. Workington appeared to be closed. We eventually found an ambulance station and were pointed back in the right direction after a northerly detour. We rejoined the C2C route at Cockermouth. The rest of the ride went pretty much like the start, we were soaked to the skin from about ten minutes in to the ride, but warm enough with the effort. The route we took went up the lengthy climb to Wythop Woods. This off road route would be ideal for mountain bikes but in the torrential wind and rain coming down the very steep rocky paths it was more like gorge scrambling than cycling. Did I mention we got lost again? The route then became slightly easier as we headed past the lake to Keswick. With wind and rain forecast again we were pleased that the day started out dull but dry. We set off up the steep climb out of Penrith with the E-bikes earning their living. We had just got onto the flat section when I noticed a sign saying 'Good Luck Jeff and Mike'. That's a coincidence I thought, that's our names! Looking up at the faces of the two smiling ladies holding this beautifully decorated sign I recognised the two sisters of my neighbour in Wales, June and Florence, who both live in Penrith. We stopped, chatted, took some photo's and went off smiling. The ride on day two was very different to the first day. Although the route difficulty is described as 'very tough' we stayed dry and managed the huge lengthy climb up to Hartside Summit well. My brother Mike on the little Dash just sat down and kept on riding. Myself on the Granite LCD had to do a fair bit of zigzagging and dancing on the pedals to keep going up the really steep parts, but we both made it to the cafe at the top where we met up with our trusty support crew. It was so windy and rainy at the top we struggled to find a place to stand the bikes up and were glad to get inside the cafe. Once inside we huddled round our hot drinks because it wasn't that much warmer inside than out. Once off again we had a brilliant fast descent to Alston. Both bikes coped very well at high speed on the wet roads. The rest of the ride was very steep but progressing well until 4.2 miles from our destination for the day and Mike's Dash ran out of battery power! Now I knew why going up Hartside had looked so easy for him. I had been trying my best to conserve power! Luckily it was mainly downhill from where his battery went, Mike says the 4 miles were OK but the 0.2 of a mile was like riding with his brakes on compared to having the motor assist up the climbs! We were booked in B&B at the Miners arms in Nenthead. Once again we were offered a garage for the bikes and great accommodation. We abandoned a walk around the village that evening as it was freezing cold and raining. We decided on a nice meal and a drink in the pub instead. The day started cold and dull with rain forecast. It also started with a climb up to the highest point on the C2C, Black Hill. Despite all this it was great and the scenery spectacular if somewhat bleak. After another fantastic descent past old abandoned mines and isolated buildings you cross over the borders with Northumberland and County Durham on this route. I don't think we saw a soul until we rolled into Rookhope for our planned lunchstop with the crew. Even after climbing over the two highest points we arrived well ahead of schedule so had a lengthy coffee break in the truck, reading the papers so we would not be too early arriving at our next B&B. On setting off we found the main route closed due to grouse shooting so had to take the alternative road route via Stanhope. This meant more descending but resulted in another huge long and hard climb up to the cafe at the top off the Waskerley Way. When we arrived at the cafe at first sight it looked like a major crime scene. Police cars and men everywhere. Turns out they were filming an episode of 'Vera' an ITV police drama. A nice coffee and our first chat on the trip with fellow cyclists and we set off the long steady decent down the Waskerley Way. The weather was brightening, it was downhill all the way to our Bee Cottage B&B and the scenery great. This was more like it. That evening we decided to go into Consett for a meal. We drove in and circumnavigated the town twice. We had all but given up hope of finding anywhere when we asked a passing local who pointed us to a lovely Italian restaurant. A good end to a good day. The day dawned bright and with a clear sky. We had our breakfast chatting to a couple who were also completing the C2C. They had set off a day earlier than us and showed us just how much better prepared they were by producing up-to-the-minute laminated maps and guidebook. I have had my now soggy guide book 15 years. They had also downloaded all the maps onto smartphones but unfortunately both phones had drowned on route. The weather once outside was not as warm as it looked through the windows but it was great to be in sunshine. It was also the first time we had set off without top to toe waterproofs on. The ride to Sunderland must have been 99% cycle route with fabulous bridges and sculptures to entertain you on route. It was also 90% gently downhill. It certainly was not particularly fast as you shared the often winding cycle routes with walkers, dog walkers and for the first time lots of other cyclists, pretty much all going the other way. The arrival in Sunderland was great, dropping down to the riverside quite early and hugging the coast until the finish. We met up with the crew and had curry and chips, an ice cream and a drink sitting in the sunshine. It was like a day out at the seaside. The bikes were loaded up and we set off for the drive back home to Wales. Despite missing the leg from Keswick to Penrith I consider the ride a success. Keswick to Penrith is an easy section that we could have completed if we had just kept pedalling but it would have been no fun at all for riders or crew. By the time we had sat in the truck for a few minutes after meeting up we were all starting to get very cold, so starting off again in the foul weather just seemed stupid. Deciding to stay at B&B's was by far the best decision for completing the C2C. We had almost chosen to camp or use our caravan. Either would have been a nightmare with the weather conditions. All the B&B's were lovely and you started each day warm and well fuelled up. The bikes were great. As a dealer for Batribike I could have chosen any of the range but was more than happy with the Granite. It was comfortable, reliable, felt safe and had the power and the range required. The Dash however was a revelation. My older brother with 10 years on me and less cycling experience seemed to cope with the huge climbs very well just sitting down and pedalling his way up. The Dash also coped with the off road sections if anything better than the Granite. Maybe the lower centre of gravity? I had deliberately left both bikes completely standard for the trip and this turned out to be no disadvantage at all. All we did was add panniers to the Granite and a rack bag to the Dash. At the end of the ride I was still comfortable sitting on the saddle and no real aches or pains except my back but it was like that when I started! I did wear cycling shorts under my trousers but other than that normal outdoor clothing. I wonder if I would ever have got round to riding the C2C on a normal bike? Probably not. As I have said previously I had the guide for 15 years and only got round to organising the trip after getting an E-bike. I'm pretty sure my brother would feel the same if not more so! The next plan is to work out a Trike friendly route squaring off Anglesey for Keith (Trike rider) and Fiona (big Dash fan) to ride and me to swap to a backup role. On Sunday I acted in a support capacity for the charity Cycle Event organised by Action Medical. I had not marshalled a cycle event before so it was with some trepidation that I turned up at the start at the unearthly hour of 06.15. The sky on the way there had been a magnificent shade of pink and I was hoping that it wasn’t the traditional warning of wet weather to come. The start was at Gosfield School towards the north of Essex there was plenty of parking for the riders and there was a cycle surgery for that last minute fine-tuning. The day before I had emptied out the Batribike van so that I was ready to pick up any damaged bikes or any riders that could not complete the course. I was provided with some puncture repair items, drinking water for riders, a hi-vis vest, maps of the route and a lunch voucher. My first “station” was the lunch venue at Great Leighs village hall where I was the first to arrive. Very soon though there were volunteers putting up flags and banners and setting out tables for drinks. Inside, a whole catering event was going on with a marvellous buffet set out for the riders (later on I nabbed a lovely piece of chocolate gateaux). One of the attending Red Cross ambulances parked up behind me and once all the riders had left the start the cycle workshop arrived to help with any further repairs. Most of the morning was very quiet and so I read my book, but then from 9.30 the first riders started to arrive. There were three routes the Champion -100 miles, The Classic – 66 miles and the Cool – 32 miles. The lunch stop was pretty much in the middle for all routes. By the end of the morning riders were flooding in and were sitting about on the grass in the sunshine enjoying the buffet provided. One of the other marshals came in with a bike that needed to go back to the start and one lady competitor decided that she couldn’t complete and asked for a lift back. So with the two bikes and a passenger on board I headed back to Gosfield. A motorbike at the rear of the ride was reporting where the tail enders were and it was decided to send me out to Finchingfield to another feed station. I stayed there until the last riders had passed. I had picked up one other bike whose rider had gone to hospital with a suspected broken collarbone. It was then time to de-sign the course, Ralph who was in another vehicle for the day arrived and we trundled along the remaining 15 miles of course removing all the signs. This was probably the most fun part of the day, hopping in and out and stacking the signs in the back of the van. Although most of the day wasn’t very exciting that is a good thing as it meant that nearly all of the 700 entrants were able to complete the course. The riders that I spoke to said that they had a fantastic day and that the organisation and food facilities were excellent. They were looking forward to going back next year. The day finished with another fantastic pink sky, the sun was setting as I drove home, a full and satisfying day for my first time as a marshal.